Window blinds and ceiling fans are often two of the dustiest items in your house. Unless you are vigilant about giving them a good dusting every week or so, blinds and fan blades collect a build-up of dust, dirt, and airborne particles that settle down and collect yet more dust and dirt. If you are ready to do some spring cleaning, make blinds and fan blades your first point of attack. Getting those clean will not only do a lot to freshen up your rooms, but you will feel like you accomplished a lot in a very short amount of time. It’s probably not necessary to remove cloth blinds and run them through your washing machine. In fact, that might be very damaging to the blinds themselves. The best way to clean window blinds made of cloth, such as roller blinds or Roman blinds, is to use a dry sponge. A dry sponge is made of rubber and can be used to remove dust and dirt from cloth. Simply rub the dry sponge over the blinds, making sure to get every square inch of fabric. If you encounter stains, try using some carpet shampoo or other dry foam cleaner to remove the stain. Vertical blinds are usually made of cloth strips. You can use your dry sponge or a duster to wipe vertical blinds from top to bottom, never from bottom to top. Metal or vinyl blinds can stand being washed in water. If rubbing down individual slats with a bit of vinegar diluted in water doesn’t work (vinegar helps break down grease and dirt without removing paint), remove the blinds from the windows and give them a more thorough scrubbing in the sun or in a bathtub that has been lined with a towel. Sturdy metal blinds can also be gently rinsed with a hose. It’s generally not effective or desirable to completely soak metal or vinyl blinds in water for more than a couple minutes. Wooden blinds should never be soaked in water as this can warp them. Use a glove or duster to remove the worst of the dust and dirt. 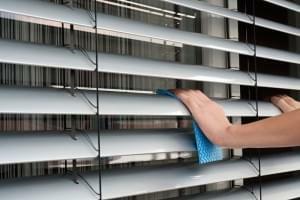 If the blinds still need to be washed, use a damp cloth (vinegar and water works here) and gently rub each slat clean. Finish up by drying each slat with a clean towel to prevent warping. Check at your local hardware or home improvement store to find dusters specifically made for ceiling fan blades. These dusters wipe both the top and bottom of the blade simultaneously, saving you time. If the blades are really dirty, you can use a little vinegar-water to wipe them down by hand, even if they are made of rattan or wicker. Just be gentle not to bend the blade out of position or soak it too much. If you are moving to a new house and want to take your blinds with you, first make sure that they are of standard size. Custom-cut or custom-made blinds for windows that are larger or smaller than standard size should probably stay with the house. Otherwise, carefully remove the hardware from each set of blinds and store it in a plastic baggie, attaching the baggie to the blinds to keep everything together. Wrap each set of blinds in towels or blankets to keep them protected against scratches and dings. Value Store It offers quality self-storage units in multiple locations throughout Florida, New York, and Connecticut. We’re ready to help you identify the right storage unit for your possessions—whether you’re moving, need temporary storage, or just want to get some things out from under foot. Visit our Home page to get started today.